As a tablet-style, portable ultrasound, the Samsung Medison UGEO PT60A is an optimal choice for point-of-care, bedside, emergency, and veterinarian applications. Weighing at just 7 pounds, this powerful, compact ultrasound makes usage similar to that of your standard tablet, complete with full touchscreen interactivity (touch, swipe, and pinch). 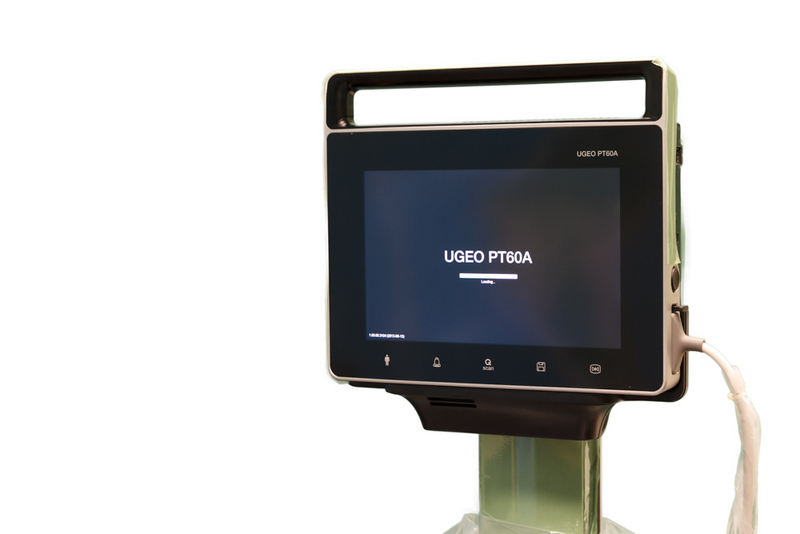 Despite its size, the Medison UGEO PT60A ultrasound brings powerful applications and imaging performance. This portable ultrasound includes color and PW Doppler functionality, optional speckle reduction imaging, compound imaging, needle-enhancement software, AutoIMT measurements, and QuickScan one-touch image optimization. SDMR – Eliminates unwanted speckle noise while providing exceptional contrast resolution and enhanced edge definition. Spatial Compounding Image (SCI) – Controls ultrasound beams electronically to provide enhanced definition in soft tissue planes. Combining excellent image quality, multiple transducer options, and its light and portable size, the Medison UGEO PT60A ultrasound is an affordable, performance-boosting choice for most clinics. The best part of the PT60A is its surprisingly good image quality in such a small device. It’s versatile and can perform multiple different types of exams, including standard measurements as well as velocity Doppler measurements. This is an excellent choice for bedside Point-of-Care applications, veterinary, and optimal for Emergency Departments. Images save directly to an SD card or can be transferred over a network.